Did you know that Pennsylvania has over 50 nonprofit organizations and programs for retired race horses? All of which are dedicated to the rehabilitation and retirement of nearly 26,000 Pennsylvania race horses. The State Horse Racing Commission would like to share some of the success stories from Pennsylvania’s Thoroughbred and Standardbred retirement programs. One of Pennsylvania’s retired race horse programs is Turning for Home, a 501 (c)3 non-profit group that has provided 2,000 race horses with a safe retirement since 2008. The program was established by the Pennsylvania Thoroughbred Horsemen’s Association (PTHA) of Parx Racing. It is a unique program because most of the funding for the program comes from Parx’s owners, jockeys, breeders and the racetrack. No horse is turned away from Turning for Home if they are lame or injured, this program truly takes care of their own. When a horse is placed in the program, owners and trainers can rest easy and know their horse is retired and will never be raced at a track again. Initially, the owners care for their horses at the track while on a waiting list kept under three weeks. Each horse gets a full health exam by some of the best veterinarians in the state. Horses are then sent to one of the programs rehabilitation farms for some TLC or to recover from surgery, and wait for an opening at a retraining farm. Once horses arrive at one of the partner farms, they work with trainers on their socialization and other skills they will need to be adopted in the future. Most of Turning for Home’s adopted horses have much success competing again, as show jumpers, barrel racers and polo ponies; some are more suited for recreational riding or serving as therapy horses. P.A. Thunder is a thoroughbred race horse who ran in 48 races at Parx Racing and Penn National Race Courses, winning $151,000 in purse money during his career. He even won his last race at Penn National Race Course on November 11, 2015. Unfortunately, that race ended his career. After crossing the finish line at Penn National Race Course, he fell on the track and was clipped by another horse and rendered unconscious. P.A. Thunder’s trainer, Philip Aristone, wanted to give the thoroughbred a few months off to recover from the fall, but in April 2016 it was clear his racing career was over. Aristone decided to retire P.A. Thunder with Parx Racing’s retired race horses program, Turning for Home, for his second chapter in life. P.A. Thunder spent some time at People’s Farm in Sauderton, PA one of the programs rehabilitation farms. While there, he was assessed by the program’s veterinarians and waited for an opening at a Turning for Home retraining farms. When P.A. Thunder was ready and a spot was available, he went to Full Gallop Farm, run by Lara Anderson and her husband Daniel Brown, located in Aiken, SC. Full Gallop is a successful training farm specializing in teaching the horses and riders that compete in horse trials, or three-day events that include dressage, show jumping and cross country. Laura will tell you that when P.A. Thunder first came to them he was not interested in socializing with humans or other horses. Over the past few months he has completely turned around! With support from Lara and other trainers, he is one of the friendliest horses at Full Gallop Farm. He now enjoys zooming around his pasture with the other horses, loves being groomed and will fall asleep while being tacked. To top off P.A. Thunder’s success story, he was adopted by Sara Silverman in November. 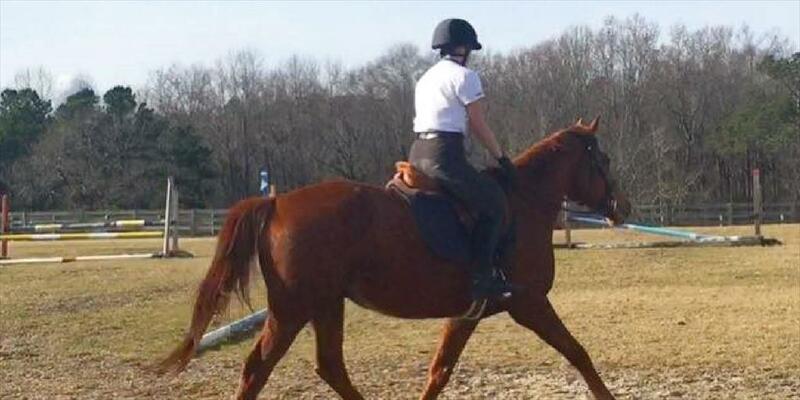 Sara is a long-time friend of Lara who has ridden hundreds of thoroughbreds over the years and responded to an ad while looking for a new prospect. She went to look at a few of the available horses and was immediately drawn to P.A. Thunder. Once she heard his whole story, that sealed the bond. She is still boarding and training him at Full Gallop Farm. Interested in learning more about Turning for Home? Saturday, June 24 at Parx Racing is the 4th Annual Turning for Home Day, with live racing, music and an opportunity to meet the people who care for and adopt these amazing thoroughbreds. Stay tuned for stories on the retirement programs available to Pennsylvania standardbreds in the racing industry!